Raith Supporters Trust » Blog Archive » Who Owns What? Click here to explore the current analysis of Raith Rovers’ ownership. Click here to explore more detail of Raith Rovers’ attendances. 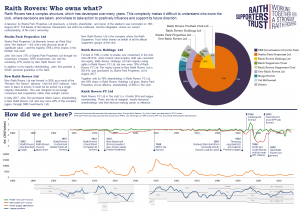 In 2008 we published our first summary of “who owns what” at Raith Rovers, and since then we have continued to update this to incorporate changes to the ownership structure and trends in the club’s performance on and off the park. Click here to download a PowerPoint file which shows how the structure of Raith Rovers evolved over the last 35 years. If you do not have PowerPoint on your computer, you can download a free PowerPoint viewer from Microsoft. Thanks go to John Litster for granting us permission to use the historical financial data originally published in his excellent book “Always Next Year”. The figures for the years since its 2008 publication are taken from the accounts of Raith Rovers FC Ltd, Raith Rovers Holdings Ltd, New Raith Rovers Ltd and Starks Park Properties Ltd – and all figures have been adjusted for inflation to current prices. Jean Lilly liked this on Facebook. Bill Powrie liked this on Facebook. Græm ERåmsïÿ liked this on Facebook. David Erskine liked this on Facebook. Andrew Jenkin liked this on Facebook. Gary McGrow liked this on Facebook. Scott Cargill liked this on Facebook.